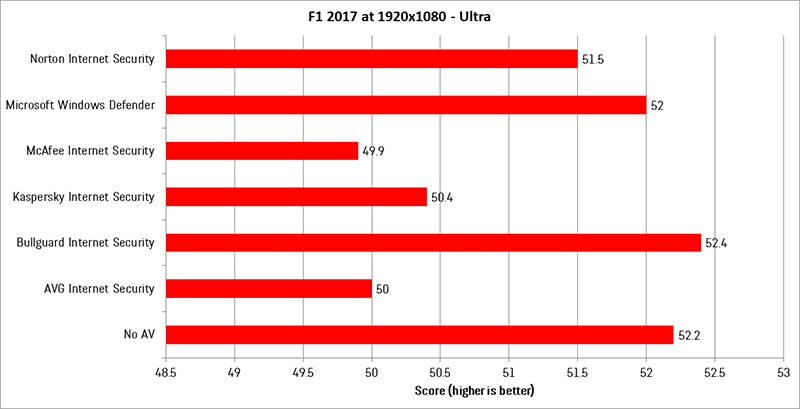 This rival-beating performance is thanks to BullGuard’s patent-pending Game Booster, which optimises CPU performance for noticeably smoother gaming with a faster frame rate and no game lag. BullGuard’s Game Booster automatically detects users’ gaming sessions and pulls both user processes (applications opened / used by users – such as Word, PowerPoint, Chrome, Winamp, etc) and system processes onto 1 or 2 CPU cores, leaving the rest of the CPU cores to handle the game. This completely removes random game spikes which negatively affect the user experience. Game Booster ensures uninterrupted gaming at a faster pace. Chillblast installed a total of six different security products, Norton Internet Security, McAfee Internet Security, Kaspersky Internet Security, BullGuard Internet Security, AVG Internet Security and Windows Defender. Chillblast also wanted to run the tests on the system with no protection whatsoever given that some gamers don’t have active antivirus software on their computer at all. Before and after each benchmarking test was complete, Chillblast restored a “clean” Windows image to the pre-testing state to ensure any residual AV software left after one test couldn’t impact the next. Privately held, BullGuard is based in Bucharest, London, Silicon Valley and Herzliya, Israel. Follow us on Twitter @BullGuard and @DojoSafe, like us on Facebook at BullGuard and Dojo or learn more at https://www.bullguard.com/.